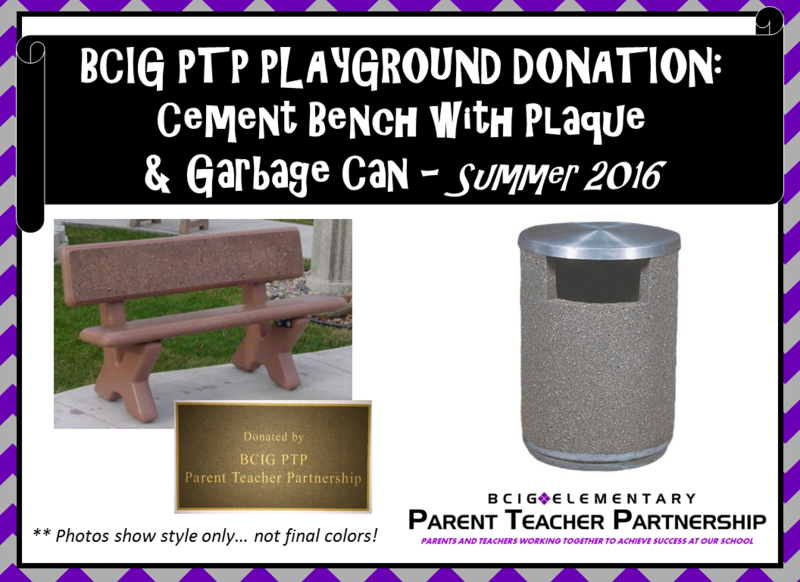 BCIG PTP PLAYGROUND DONATION: CEMENT BENCH WITH PLAQUE AND GARBAGE CAN - these two items have been ordered and will be put in our playground the first week of August. A bronze plaque will be placed on the bench from our PTP group. See attached image for what the styles will look like - the colors are not final. We are also looking into something new for the kids to play on... this is still pending but in the works! Thank you to everyone for your help and support - it is a busy time around school and we appreciate all that you do!! GO FALCONS!! Thank you to Ruth Bennett for recommending that our PTP group begin collecting these labels! This is another quick & easy way to earn free money for the BCIG PTP! Simply cut & save your codes from participating Kellogg's products and send these to school with your Box Tops, Campbell's Soup Labels, and Our Family UPC Codes. Please note that some of the codes are printed on the inside of specially marked Kellogg's boxes.